From time to time people suggest in comments on the blog that 'nobody uses modern stamps anyway, only collectors and dealers'. So I thought I'd show some examples of recent stamps used by non-collectors. 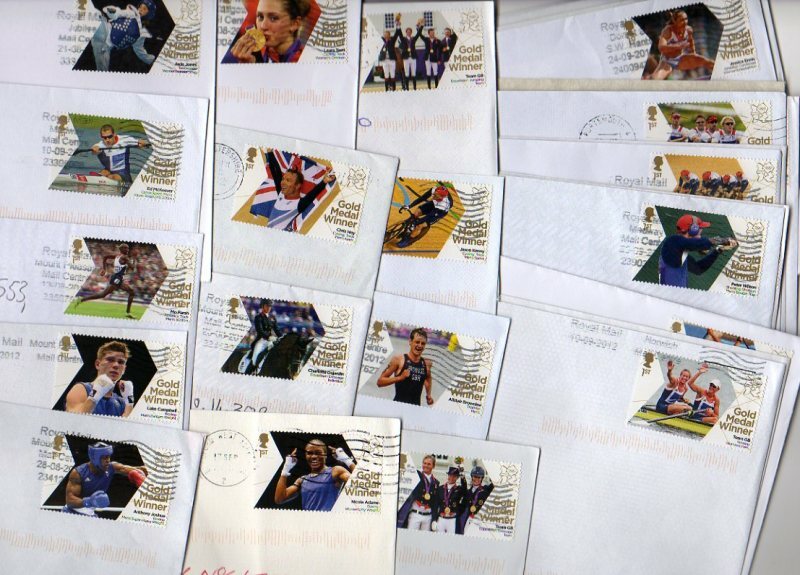 This batch is the complete set of Olympic Gold Medal stamps (not all show on the spread), all on newspaper prize crossword competition entries. Winnie-the-Pooh airmail rate on commercial evangelical mail. British Musicals, on the Prize Crossword entries. So it's there if you look for it, but I suspect most people don't collect this sort of material because it doesn't interest them, or because it's too difficult. But surely that's what collecting is all about. Enjoy the hunt! Looks like crossword competitors still use stamps to forward their eateries. Let's hope that 'news papers' aren't in some sort of conspiracy with the RM to boost usage. 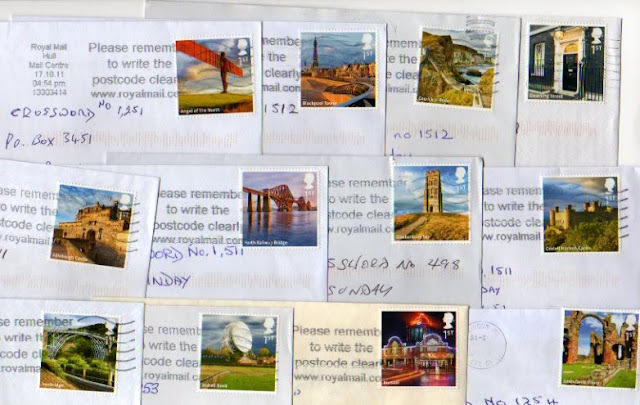 I was not suggesting that there was no postal usage for UK stamps merely wondering what % of stamps actual did their job, deliver mail and thereby justified the prolific issue of stamps of all types. 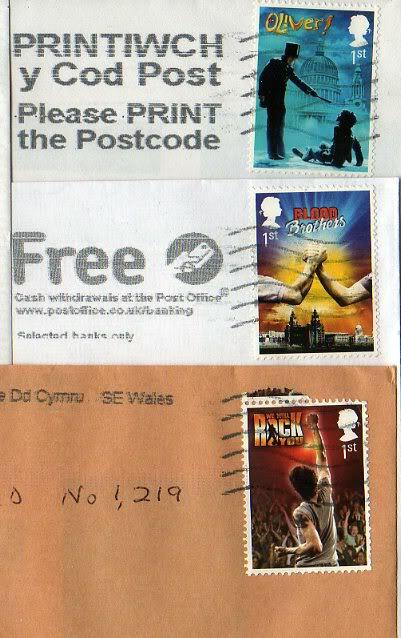 If you send post, do you use nice stamps? Well, I hope ALL our readers take the trouble to source special stamps, and use ones that are appropriate to the recipient where possible. Sadly many of our customers used ordinary 1st & 2nd Machins, and some even re-use those that have been through the post but not been postmarked - yes, we can tell!! But I don't get cross about it - well, not very! I tend to make the effort at Christmas but I was later than usual getting them ready this(? - 2012) year and the queue was too horrible to contemplate so I cheated and used the Post and Go machines with the cattle faststamps instead... pity the PO hadn't thought to load up a more seasonal batch, but then you can't have everything, and that option did save me a lot of time. That's a surprise - there was a new Christmas Robin Post and Go stamp in use in most offices - maybe you left it so late they had run out :-D ? I used a Wallace and Gromit stamp in a Wallace and Gromit competition and won the prize of a Wallace and Gromit collectors item signed by Nick Park. I collect modern commercial covers - both for scarce stamp usage and postmarks - and I agree with Ian when he says they are there to be found/acquired. Being a little argumentative, I feel many British collectors have forgotten that good collections require a little more effort other than filling in a direct debit! 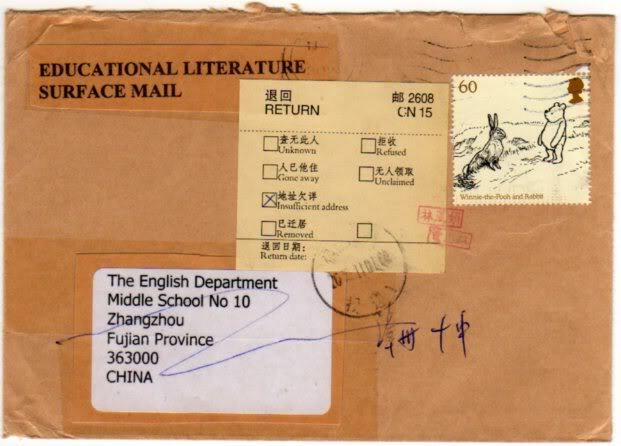 I always try to use interesting stamps on my mail whether it's knowingly for a collector or for someone who might notice the stamps and possibly become interested. I also enclose SAEs with a lot of my correspondence to make sure I get some interesting commercial mail coming back my way too! 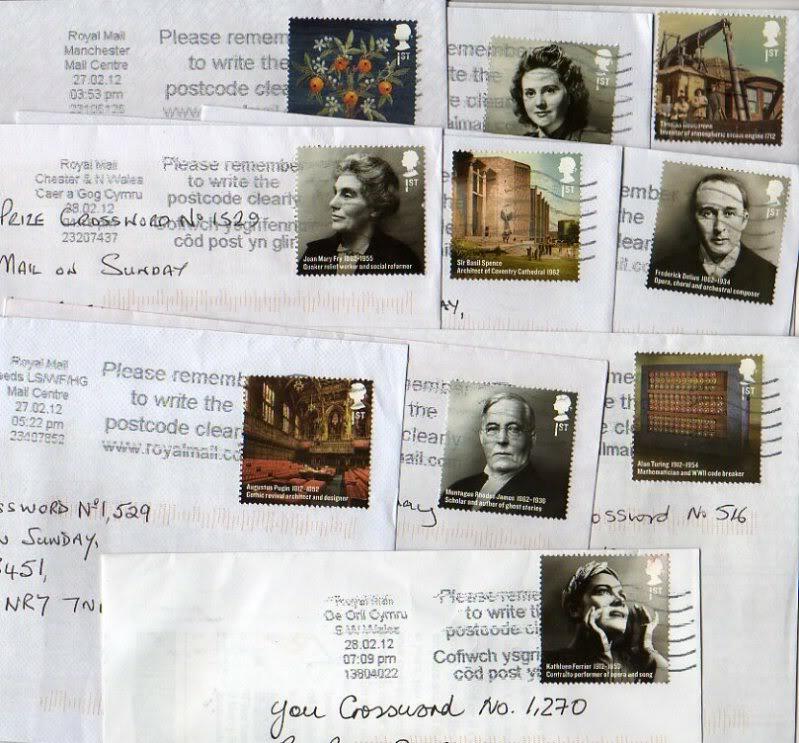 The feedback that really annoys me is how the postie cancelled the stamps using a biro! Aaaargh! This happened again today on a standard C6 envelope I sent bearing Post & Go stamps. Couple these instances with the high volume of uncancelled mail I see and I wonder why Royal Mail bother investing fortunes in all their "revenue protection" printing methods.